So much snow flew across southern Oregon’s Highway 66 at o-two-thirty-dark, as I made my way to Lower Klamath Refuge, that I thought I was going to run off the road for sure. We arrived and then it hit me how cold it was as the warmth of the vehicle left me. I was worried. I wasn’t hunting with my cold weather hardened duck dog, a 100-pound Chesapeake Bay retriever, I got in Alaska as a three-quarter pound puppy. His being missing really hitting me with sadness as I could just start to see the snowed peak of Mount Shasta in the distance. Seochael (short for Matahan Seochael, Peaceful Bear in Scottish) had passed more than ten years ago. 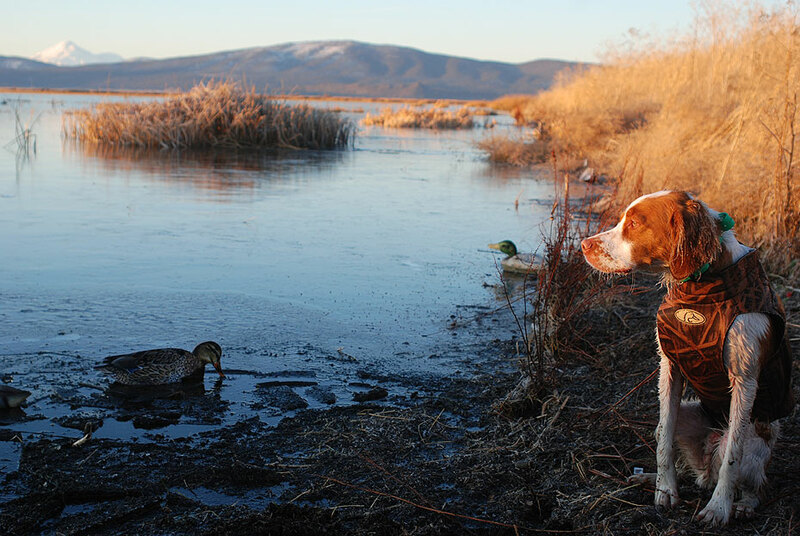 There's something magical about duckhunting in view of snowcapped Mt. Shasta! By my side was my new bird-hunting companion. Like Seochael before, Ziggy was my utility dog: he not only pointed pheasants and chukar, he would for the first time be taken into the field to retrieve ducks from water. There was only one thing…Ziggy’s a Brittany (we don’t call them Spaniels anymore) more suited to warmer, drier pheasant fields. Now, don’t get me wrong, I’m all for traditions. Hunting being one of my most cherished. But veterinary medicine has come a long way, and what we thought were conditions that dogs were bred for, were in the long run cutting down the longevity and quality of life for a dog, not the least of which is arthritis that comes on early because of extended time in ice cold water. Everything you can do to keep your dog too long in a cold can delay that onset of old dog ailments. The normal body of a dog is higher than humans: 100.5 to 102.5 degrees Fahrenheit. If your dog’s body temperature goes below that it’s a bad sign. If it hits 96 degrees your dogs in real trouble! Other symptoms include depression, lethargy, weakness, shivering, muscle stiffness, low heart and respiratory rates, stupor, difficult breathing, and fixed and dilated pupils. Worst of all, as it’s near too late, is coma. For a dog that had only learned to swim two trips ago, dealing with ice and snow would be no small feat for Ziggy. As it was, it would be until our next trip out to Grizzly Island the week after Thanksgiving, that we’d get into ducks. This Saturday after Thanksgiving that I was hunting Lower Klamath, on the other hand, was a total bust. What was important was that the conditions were so cold that the area I was hunting required me breaking one to two inches of ice to place dekes, and that the water refroze within only an hour. During all this, my thin-skinned Brittany pointer, did fine: Ziggy doesn’t even like to get wet during a bath. Now he’s a duck-hunting fanatic! What was it that made something like this possible? A good neoprene dog vest! 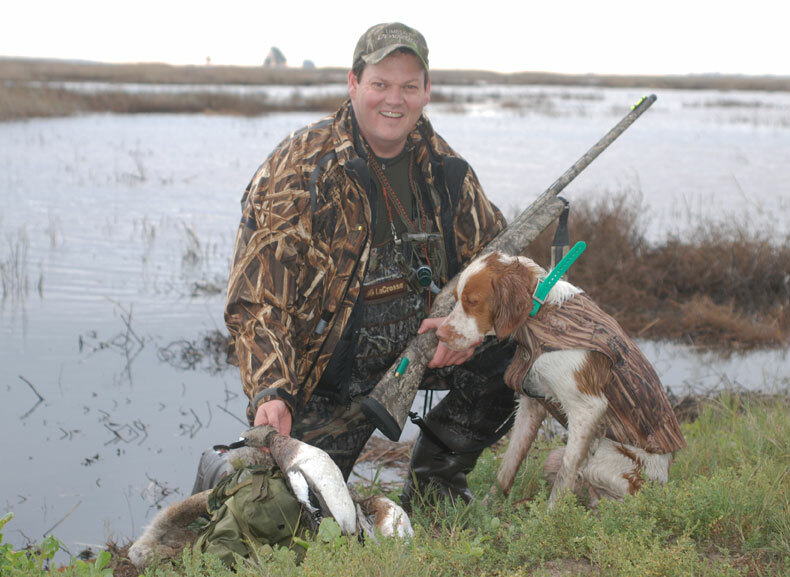 It was so important to the venture that I couldn’t wait until I was back at the office in San Francisco to pick up the 5mm and 3mm dog vests that Avery Outdoors had sent me to review. I ended up running over to Medford, Oregon’s Sportsman’s Warehouse the day before the trip to Lower Klamath Refuge: not even two years old, I didn’t want my new hunting buddy dying from hypothermia. As you can see from Ziggy’s icicled whiskers, it was cold. We don’t get that kind of freeze in the San Francicsco Bay or Sacramento Valley that I normally hunt for waterfowl. As we waited at the ice’s edge for the ducks that never flew (holding in the closed zone to recover from the previous days’ storms-to say we missed it would be an understatement), I would every once in a while slide my hand between the vest and Ziggy’s back. It was like a furnace under that neoprene-and having Ziggy in an Avery Boater’s Dog Parka with its handle harness was an added asset when I had to get him out of the water and onto the ice! Sure he shivered, but often it was only because he was anticipating birds. By the time we left this ice-cold blue bird day, Ziggy was fine and toasty in his 5mm vest. And it wasn’t only that he was protected from the dry air cold, but he was also defended from the cold of having followed me in the water as I set my mallard and widgeon decoys. A week later, at Grizzly Island Refuge, conditions were strikingly different. This time Ziggy was chest deep in water with me–and he retrieved his first two ducks, a male and female widgeon! Though we were into December, it felt as though were hunting the much warmer early season, and I felt no guilt in my very warm and comfy 5mm LaCrosse waders, as Ziggy was well protected in his 3mm Avery dog vest. What’s more, unlike a dog vest I tried on my Chessie, so many years ago, these vests easily fit a number of body types with minimal adjustments. With regards to Brittanies, Ziggy is of the tall and lanky, unlike the shorter and stockier variety, which could easily be snug with the straight chest to waistline of a Lab. And still, the vest fit perfectly. Each vest has a zipper and length of Velcro that goes the length of fastening to enable custom adjustment of 1.5 to 2 inches from chest to waist. Also, you can also trim with a pair of scissors. As we’re deep into cold weather, do your duck dog a favor and get him or her a neoprene dog vest. And if you’ve got a pointer or Spaniel that you thought might not be a great all-round bird dog, get a neoprene dog vest for your dry field hunting partner and enjoy the extension of a season that stretches into ducks and geese! In the photo below I’m warm and cozy in a LaCrosse Brush-Tuff™ 1200G MO Break-Up® Waders that arrived just in time. 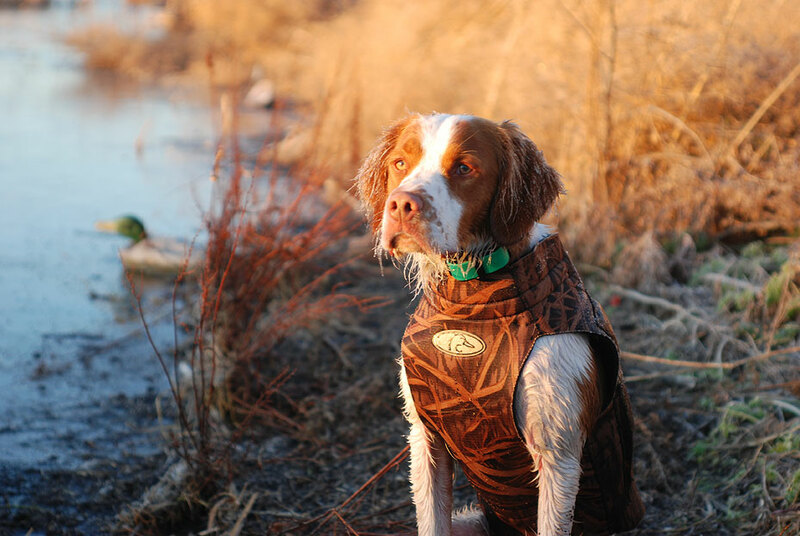 You can order your dog a vest directly from Avery Outdoors’s Sporting Dog Website.